We need the trinity of tech spec – small, reliable and super-high-quality. The hardest part of this for us was the PA. We clearly couldn’t fly with the amazing Mark Audio system that we use in the UK, and as supportive as they are to us, they just don’t have any gear in the US at all for us to use (this stuff is hand-made in Italy…). So we used it as a chance to try out something new. 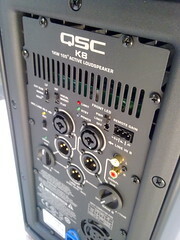 I’ve owned QSC gear in the past, and it’s always been super-reliable and solidly built. They agreed to lend us a pair of their K8 powered speakers. The specs were impressive – very small and 1000 watts a side (yes, a THOUSAND watts in a single 8 speaker!) They were shipped to the venue of our first gig, and on plugging them in we were immediately all smiles. Incredible sound, lightweight, amazing bass response, really well designed back panel. Pretty much the perfect house concert speakers. Gig after gig we were floored by the quality, delighted by the ease of packing them up (QSC have specially designed bags to carry them in), and I was able to use them when recording/mixing at Trip Wamsley’s house too. We were able to run the other musicians we played with through the speakers too, and never got close to the headroom of the speakers. Remarkable. It was also our first long tour using our new MOTU Ultralite mixer, being controlled by my new Dell Mini10V netbook, which we also recorded all the shows onto. The combination of the new mixer and the complete set of Evidence Audio cables that we ordered before the tour (that again were shipped to the first gig – Tony cut into his usual production schedule to finish them for us (we like weird cables) and make sure we got them – a total star!) 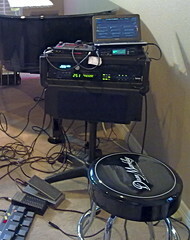 meant that the whole set up sounds clean, super-low noise, and really flexible. We used to use two mics live, one for looping one for main vox, so we could have a switch on the loop mic (a $30 mic!) but now that I can EQ that mic in the MOTU, it sounds like 10x that, so we only need the one. This was also the tour where I finally fell in love with the sound of my reborn bass. You’ll remember that on our last US trip, the body of my bass was destroyed by the airline, and then replaced by the amazing people at Modulus Guitars. 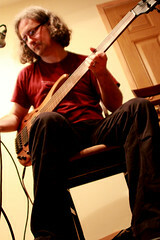 I’d been playing the bass as it was for a decade, so it took me a while to adjust to the new sound. I liked it from the start, but it wasn’t ‘my’ sound in the way that it had been. Now though, it’s sounding better than ever – the recorded sound on Live So Far is the best bass tone I’ve ever had, and the expressive side of the instrument is unlike anything I’ve ever played. Guess it just took a year to settle in, and I’m sure the clarity in the new system helped a lot. So there you have it – QSC, Evidence Audio, MOTU and Modulus, combined with my ever-present Lexicon MPX-G2 (which broke on one gig – has an intermittent fault that I can get fixed, and work around… phew!) and the amazing Looperlative (which becomes a more and more transparent part of my musical flow every day – I can’t imagine making music without it). The software we’re using on the netbook for recording is called Reaper, and it’s outstanding. I’m so pleased with it. There aren’t many music recording programs that will downsize to the screen of a netbook, but this is great. Highly recommended. what a helpful blog. i definitely will be considering purchasing some of these products in the future. that audio setup sounded amazing in my house! Did you already have a relationship with QSC, or did you simply call them up out of the blue and asked for some speakers? I’m wondering why they were willing to cater to a touring group because I’d like to make use of this strategy? How did the interactions/conversations go between you and QSC that led to you getting free speakers for a few weeks? I’ve known QSC and had involvement with them for years – they don’t even have an artist relations policy. This was because of a) a really good friend at the company, and b) the kind of social media exposure that they didn’t have before, as well as the number of musicians they knew we’d be connecting with out the tour. It was a decidedly non-standard offer, and probably not one we could repeat too often, given that we’ve ‘been there, done that’. It was largely due to having a good friend pretty high up in the company, a reputation as a trusted endorser/gear demo person, experience as a journalist and a fan-base that fits their demographic. Thanks, Steve – really appreciate the post and your QSC thoughts. Thanks!